Japan has been the testing ground for some of the most innovative products recently. Fast food chains have experimented with gourmet burgers, themed options and even a burger buffet. Now Pepsi is introducing a new Pepsi Energy Cola exclusively in Japan that features infamous Star Wars villain Darth Vader on its can. This isn’t the first unique drink Pepsi has created oversees. Earlier this month the brand introduced Pepsi Special, a fat-blocking soda with a fiber molecule called “dextrin”, intended to prevent the digestive system from absorbing fat. The Japanese government has affirmed that dextrin colas are “food for specific health use”, based on findings that indicated that rats fed dextrin and fat at the same time absorbed less fat than those that ate fat alone. Pepsi also introduced a tangerine-flavored clear soda called Pepsi White. Pepsi White will be available in Japan starting December 11th, and the bottles are decorated with snowmen in tune with the holiday season. Mandarin oranges are associated with the New Year in Japan, which helps to explain the origins behind this particular Pepsi offering. 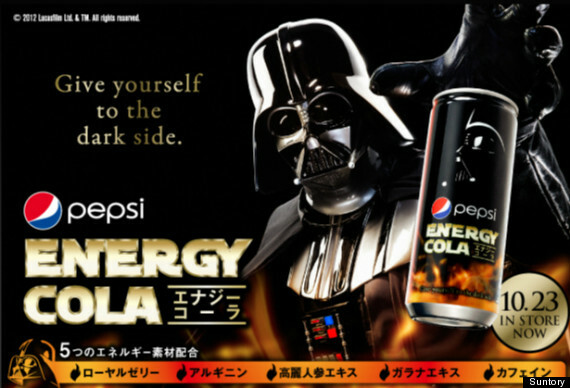 Darth Vader themed Pepsi Energy Cola is now available across Japan. There is no word on how exactly the product correlates to Star Wars, but featuring such a popular character is sure to create a buzz. The product is made with ginseng, guarana extract, caffeine and royal jelly extract. Royal jelly extract is a secretion from honey bees which is meant to feed adult queen bees and larvae. While energy drinks continue to rise in popularity, some of the ingredients in Pepsi’s new drink sounds suspect. But who are we to judge until we try it? Hopefully some of these unique Pepsi products will cross the ocean soon so we can fully weigh in on them. I don’t write many responses, but i did a few searching and wound up here Pepsi Launches Darth Vader Themed Energy Drink | Dailyfoodtoeat. And I do have 2 questions for you if you don’t mind. writing at additional social sites, I would like to keep up with everything new you have to post.